Tim picks his usual fairy tales and adventures. Jim finds the scary stories and funny books. I look for good historical fiction to add to the pile. I also am on a constant hunt for brown faces in all kinds of stories. Ezra Jack Keats (A SNOWY DAY) comes home with us, along with Vera Williams (MORE, MORE, MORE SAID THE BABY). Trina Schart Hyman's illustrations of brown princesses and Chinese princes catch my eye. There weren't any picture books I could find back then about the Indian-American experience and/or our colonial heritage, but today, I could have added CHACHAJI'S CUP by Uma Krishnaswami, for example, and GRANDFATHER GANDHI by Arun Gandhi and Bethany Hegedus to our pile. But what if the ONE BOOK I could find featuring an Indian child was a sweetly-told tale about food? In one panel, a sari-clad mother and her brown child are standing around a table of feasting Brits, serving them during the Raj period. The Indian mother and daughter are smiling and looked safe, but later they subversively and courageously claim part of the meal while hiding in a closet. Our boys were four; they colored self-portraits at school with dark brown crayon. They knew they were Indian. Their grandmother wore a sari. They knew who they resembled physically and ethnically on big and small screens, as well as on the pages of books. If the story I described in the preceding paragraph had been the ONLY BOOK—the single story—reflecting their emerging ethnic identity, I might have hesitated to take it home. How could I use this ONE BOOK to explain to the boys why Indians had been forced to serve the British for so many years? How would I underline the suffering of colonial oppression that our ancestors had endured? What would that ONE illustration convey to them about power, culture, race, and privilege? But what if I'd also had access to both of the picture books I listed earlier, and more? What if there were multiple stories around which we could gather as a family that represented the uniqueness (windows) and normalcy (mirrors) of Indian people, both past and present? Then my decision about that ONE BOOK would have changed. I would have loved to take it home, because we had a wide collection of stories and images in which to place it. 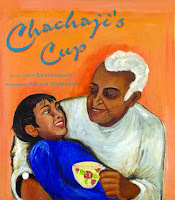 I could have said, "Remember in CHACHAJI'S CUP when we read about how Britain ruled India? This story takes place in that time. 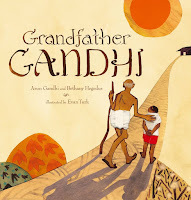 This is before GRANDFATHER GANDHI led the Indian people to freedom." Given the current discussion about the representation of slavery in picture books, I'm posting my favorite TED talk by Chimamanda Adichie below. My hope is that even during this racially-charged season of history as a nation, we remember not to outsource the entirety of the black experience to a single story. Let's take stock of the emerging and existing collection of stories we offer children around the storytelling fire. Are we creating, publishing, sharing, compiling, buying, featuring, and promoting MANY stories all year around about black lives, past and present, offering a plethora of windows and mirrors? I'm glad Debbie and Edi Campbell and others keep asking the questions. They call us to be thoughtful, tread carefully, and unpack the intersections of our own privilege—as we must, given our collective and individual inescapable histories. It's no use whining, "I wanted to include a fill-in-the-blank character but I was scared of what 'they' might say, so I didn't." That's the laziness of privilege. What we need to ask as a non-fill-in-the-blank writer is: "I want to create a fill-in-the-blank character because it's needed in my story, so how can I listen, learn, hold babies, and do as much good, important work as possible before writing a fill-in-the-blank character who has fill-in-the-blank power and privilege compared to me?" And then we might still make mistakes that make us and others cringe. Welcome to the powerful vocation of storytelling for children. Good thing we're not in this alone, writing a single story, right? Editors, publishers, booksellers, prize committees, and reviewers, I appreciate that you are producing and celebrating MANY STORIES about MANY CHILDREN! Keep it up! MORE, MORE, MORE, say the babies! Teachers, parents, librarians, booksellers, as you display, handsell, promote, and read MANY STORIES aloud, maybe we won't need this heated and difficult discussion about ONE BOOK. Although to tell you the truth, I'm delighted that we're talking about it so widely. Because back when our boys were four and I was leading them through a library, it felt like I was one of the few keeping an eye out for brown and black faces in books. Now I have you guys, thanks be to God.